We have a Trident Trikes Terrain with 26″ wheels all-around, 21-speed, wasabi green in stock! This is a folding trike. 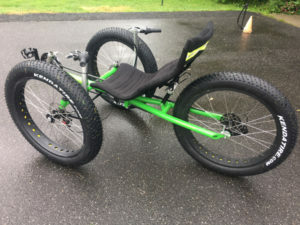 This is a fun trike great for travelling off the beaten path– dirt roads, sand, beach, woods, grass. 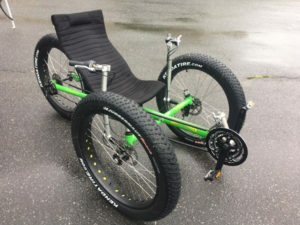 The trike has 26″ wheels all around. With the larger wheel circumference, 4″ thick knobby tires, and lower air pressure, this allows for lots of “contact patch” with the ground so going over rough ground is fun and easy! The Terrain 26 next to the Spike 2 . 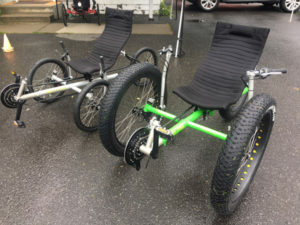 Both trikes fold. Due to many requests , beginning July 2018 we will be offering a Terrain 26 with factory installed 21 speeds with a Samox 22/32/42 Crankset. A 21 Speed Upgrade kit is also available as an option. Its consists of an FSA 22/32/42 Triple Crankset, a wider Bottom Bracket, a Microshift Front Derailleur, a Shimano 3 Speed Revoshifter, and Cabling with Cable Housing. 21 Speed Upgrade Kit gives you a Gear Inch Range of 18.5 to 85.7 on a Terrain 26, 13.8 to 58.7 on a Terrain 20.